Nolia uses all fresh ingredients to make our confections. Our chocolates are made with a directly sourced, single origin, fair trade cocoa grown in Venezuela. We recommend that Nolia Chocolates be enjoyed within TWO weeks of arrival. Our chocolates do not require refrigeration. Please see our FAQ Page for additional storage instructions and allergy information. SEASONAL FLAVOR This seasonal jewel is bright, sweet and tart all in one. Luscious buttercream infused with real fresh squeezed blood orange juice in a dark chocolate heart. Available only for the short time these precious citrus gems are in season, generally January through March. SEASONAL FLAVOR available Spring season: Sweet, tart,and tropical passion fruit blended into Italian buttercream inside dark chocolate mini egg. SEASONAL FLAVOR Available in Spring. Real mango blended in ganache dipped in milk chocolate and finished with a touch of chili pepper on top. Espresso ganache made with a secrete blend of Philadelphia’s own La Colombe coffee dipped in creamy white chocolate and finished with a dusting of cocoa - a latte in truffle form! A delicious tangy twist - organic homegrown rosemary infused mild goat cheese blended into milk chocolate ganache and dipped in white chocolate. Finished with a sweet crystallized piece of mint leaf. HOT! Ghost Chili Peppers are some of the hottest on earth! A sprinkle of ghost pepper infused sea salt blends with the creamy caramel for a one-of-kind addictive sensation! Our most popular confection! Homemade chewy caramels dipped in milk or dark chocolate then dusted with pink sea salt crystals mined deep under the Himalayas. Nolia’s chewy homemade caramels mixed with roasted pecans, dipped in milk or dark chocolate and topped with a piece of pecan. Nolia’s freshmade caramel mixed with shredded coconut and a touch of ground cardamon in milk or dark chocolate. A decadent adult version of the “chunky” bar, each 1.5” square contains cashews, almonds, walnuts, and dried apricots, cranberries, and raisins. In milk or dark chocolate, they come either 2 or 5 per package. Dark chocolate is non-dairy vegan. 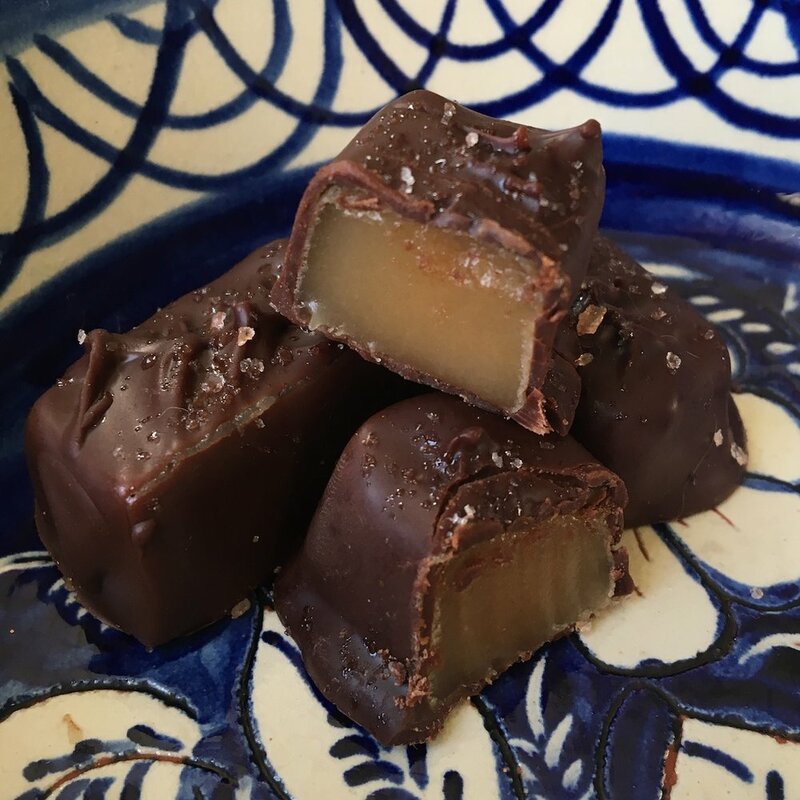 Nolia's homemade chewy caramels now come naked! These un-dipped caramels come individually wrapped in 4 ounce bags. Choose from classic Salted Vanilla, Coffee, or our new Chocolate caramel which brings back memories of eating brownie batter right out of the bowl with a spoon.